Doctor’s Best Glucosamine, Chodroitine & MSM is a dietary supplement containing a strong combination of the best three components (glucosamine sulfate, chondroitin sulfate, OptiMSM®) of the highest quality and purity, dedicated to more efficient synthesis of proteoglycans, which contribute to the regeneration and improvement of joints functioning. Contained in the product glucosamine sulfate is obtained (extracted) from chitin – a polysaccharide of glucose, which is a building material of the external skeletons of arthropods (and not only). Chondroitin sulfate is produced from bovine cartilage and has the purity of 90% or more, confirmed by laboratory tests. OptiMSM® is a highest purity (99.9%), methylsulfonylmethane (MSM), which is an organic sulfur compound, confirmed by extensive specialistic studies. Glucosamine – is an organic chemical compound that occurs naturally in the organism as a building block of compounds present in the articular cartilage – proteoglycans and glycosaminoglycans. The articular cartilage is a cartilage, which covers surfaces of bones contacting with each other, prevents them from abrasion, is resistant to friction and facilitates sliding. Greater stress on joints associated with a large physical exertion, overweight, as well as the aging of the organism, are factors which reduce the amount of produced glucosamine. Deficiencies of this compound disturb the proper functioning of joints. Crawfish, shrimps, crabs and clams are a natural source of glucosamine. In some researches, glucosamine served with chondroitin to reduce a narrowing of the joint space – a medical condition often causing pain. Chondroitin – an organic chemical compound from the group of glycosaminoglycans, which is one of the major components of the articular cartilage. It affects the maintenance of stability and strength of the joints. MSM (methylsulfonylmethane, dimethylsulfone) – an organic sulfur compound playing a structural role. It is necessary for the preparation of compounds essential for a proper functioning of the connective tissue. Special properties are attributed to the MSM in the case of allergic inflammations of the connective tissue. During studies, MSM showed anti-inflammatory and antioxidant properties, and improved the efficiency of the movement. 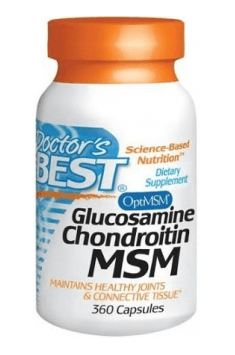 In summary, Doctor's Best Glucosamine, Chodroitine & MSM is a product designed for people struggling with inflammations of joints and with rheumatism. It is especially recommended for athletes and people trying to cure acquired injuries. As part of prevention and health improvement it should be used in the case of elderly people. Glucosamine, Chondroitin & MSM 360 caps. Take 4 capsules daily, with or without food, or as recommended by a nutritionally-informed physician. Standard doses of glucosamine and chondroitine is respectively 1500 and 1200 mg. Most importantly, this dosage is included in one serving of the product recommended by the manufacturer (4 capsules). To enjoy the biggest benefits of using the supplement, it is suggested to take it regularly for 6-12 weeks, especially to a high-risk group (athletes, the ederly and physical workers) of joint diseases and in the case of first symptoms of impaired functioning of joints. It's understood that for the dose to be effective, you have to take at least 4 capsules per day, preferably divided into two doses (2 capsules). Therapy should last at least 3 months, although its effects can definitely be seen before. I know from experience that when taken regularly, the pain and unpleasant "creaking" or "crunching" in the joints disappears. For best results, it's worth adding collagen to the supplementation.